It’s one of the things you should consider before deciding. You’ll need another way to move photos around so that your iPhone doesn’t fill up and so that you can retouch pictures with more control. Does not require iTunes wired syncing.Syncing with a computer means that computer has to store all the apps on it. I have a SSD MBP now and so storing all the apps for my 3 iOS devices on my MBP is just not an option. Plus I’ve never liked the interface of iTunes for iOS. 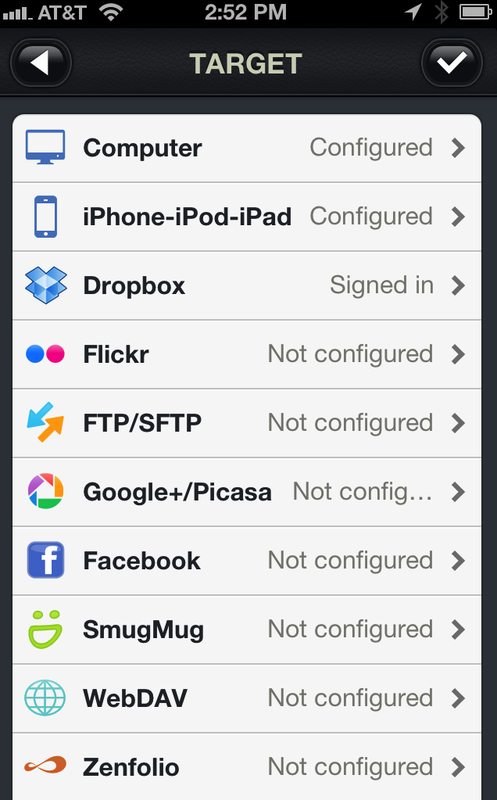 Ever since iOS 5 came out I haven’t connected my iOS to a computer. Does not require any manual operation on the iPhone.The only thing I like about an iOS with regards to picture is showing them there. I don’t like the Photos app interface for anything else. As automated as possible.I want to be able to click a couple of buttons and just it do it’s thing. Most of this occurs automatically. 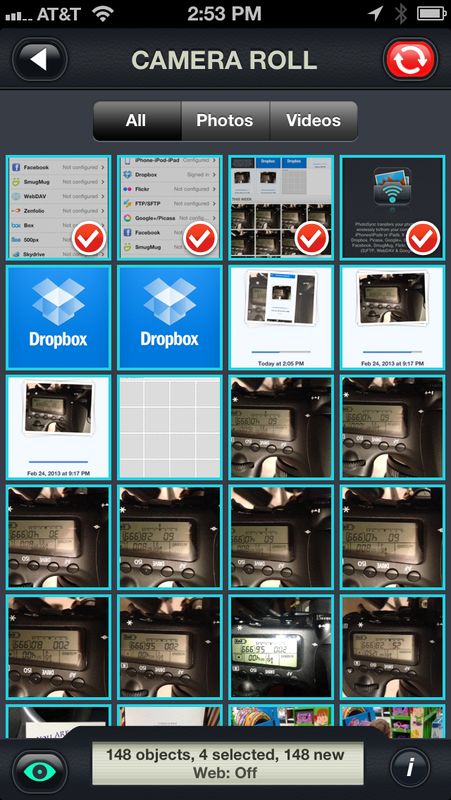 Every few days I open the Dropbox app on mine and my wife’s iPhone every few days.The Dropbox app is set up to automatically sync pictures and videos to the Dropbox cloud. I plug-in the iPhone.This keeps the upload going until it’s done. I import all those files into Lightroom about every other week.I choose the move tool. This saves me a few seconds later. They go the regular folder with my DSLR pictures. I make sure the DSLR has the right time code. That way if I took personal pictures with the DSLR while my wife was taking iPhone videos they all sort chronologically in the same folder. I plug-in my external hard drive RAID and Time Machine runs automatically. After the pictures are backed up in three places (RAID HDD 1, RAID HDD 2, Computer HDD) I delete the unwanted files from my iPhone. (They are already gone from Dropbox. )Deleting them from the iPhone is labor intensive. No that they are in LR I do my normal sorting (culling) routine. Keepers get uploaded to Smugmug using the Smugmug app. This app is extremely efficient at saving time. Monthly I move all pictures that have been Shutterflied and Smugmugged to the RAID. Here’s another option, it’s called Shuttersync and cost $1.99. If you find yourself frequently needing to put picture onto an iOS device from your mac or onto another iOS device this is perfect for you. It can upload to all these places. 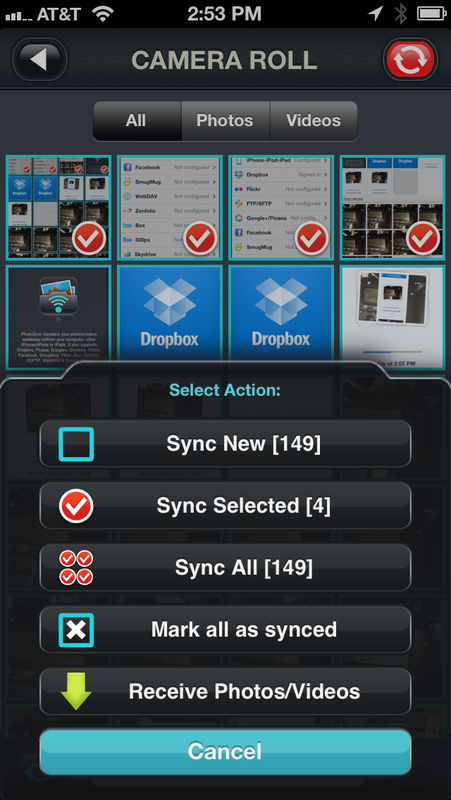 You can sync one, all or just the new ones. Then you choose where they go. 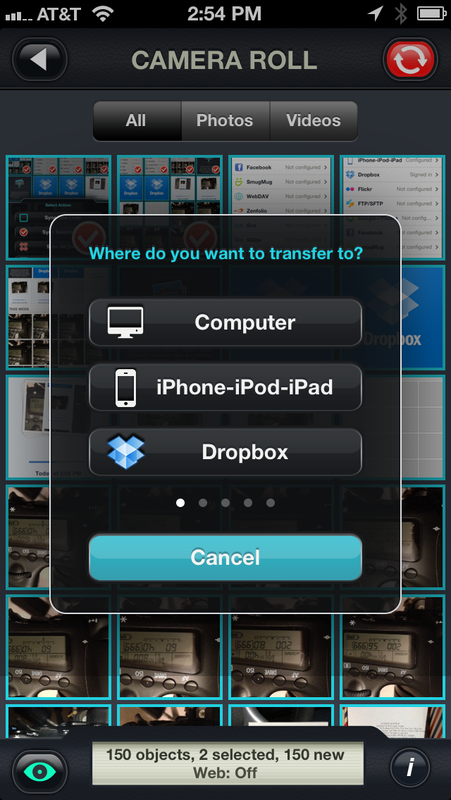 Sending pictures has more options but has a couple more clicks than the Dropbox only workflow. If you don’t mind plugging your iOS into you computer and the HDD space that takes then you should check out this article. He shows a workflow you could modify for Lightroom instead of iPhoto. Ask questions if his article doesn’t help. I’ll figure it out. Join the community by commenting below or ask questions. Forward this article to anyone with an iPhone you think may need this same solution. I’ll definitely check out the app you mentioned though. I left both on here since I didn’t know which was a better contact for you Ray. Thanks I will sure check it out! 2nd one is fine. I just didn’t see the first comment post so I added it again. Sorry about that.